One of the things that I love about the Fernbank Museum of Natural History is all the surprises around every corner. One that I rediscovered on a recent visit is their Plasma Ball...I totally want one! 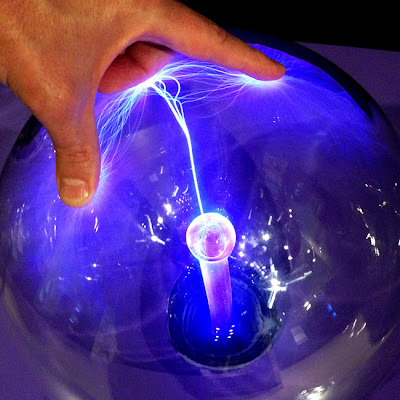 This particular Plasma Ball is in the Museum's Sensing Nature permanent exhibition. That gallery has tons of learning experiences, including a display that demonstrates how tornadoes form, another that shows how sound travels, and lots of other hands-on activities that reveal the delicate relationship between nature and human senses. "Sensing Nature playfully demonstrates the role of our senses in interpreting our environment. Interactive stations demonstrate how our senses sometimes interpret visual and audial cues, which can sometimes lead to false perceptions. As you gain a better understanding of how your senses work together to understand the environment, learn how your senses work together to understand the weather." So, when you're next at Fernbank, explore, explore, explore...there's LOTS to see and do!